SPRING WEEKENDS OR SUMMER WEEKS One House to beach- beach chairs & badges too! Breathtaking ocean and bay views and only steps to one of New Jersey's best beaches. Enjoy beautiful sunrises and sunsets on wrap-around decks. It's a short walk to many restaurants and attractions. Families can enjoy many activities such as miniature golf, amusement park, arcades, water park and of course many boating and fishing activities. Come and enjoy the Long Beach Island lifestyle. LBI is an 18 mile barrier island with the Atlantic Ocean on one side and the beautiful Barnegat Bay on the other. The island is a 1/2 mile wide at it's widest and you are never far from the white sugar sand beaches or the serenity of sunsets on the bay. Spend your vacation relaxing on the beach or enjoying the fabulous restaurants and nightclubs. Catch a live performance at the Surflight Theater, LBI's answer to Broadway. Performances are scheduled year round. You can have fun all year on LBI. Ride bikes along our flat island roads, climb the steps to the top of Barnegat Lighthouse, shop at Bay Village or Viking village, go fishing off the bay or beach or spend a 1/2 day on a commercial fishing boat, or hang out a crab trap in the bay. Everyone loves the ocean but LBI also has some guarded bay beaches for the toddler set who are too young for big ocean waves. Learn to boogie board, surf, or kayak. Rent a boat or a wave runner. We even have kite boarding and parasailing. Collect sea glass along the beach or schedule a family beach portrait. Kids love the rides at Fantasy Island and Thundering Surf Water Park. There are plenty of arcades, lots of miniature golf, and everyone's favorite- ice cream! 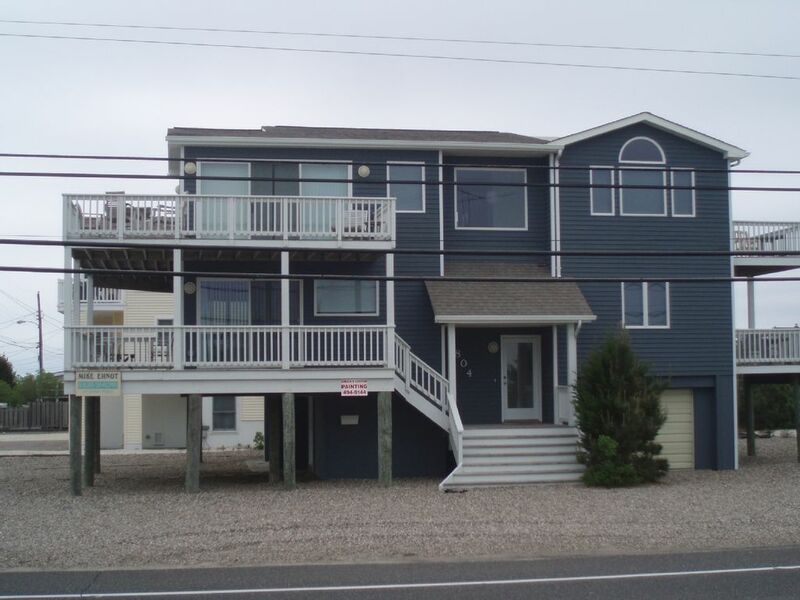 Includes 8 beach badges and internet access : Long Beach Island, or LBI as it is known to locals is a beach lovers paradise. Whether it is relaxation or excitement you are looking for, there's plenty to do on LBI. Use LBI as a base to visit New York or Philadelphia, which are around 2 hours away or travel 45 minutes to Atlantic City. My family and I had a wonderful time down the shore. The house more then met all my expectations. It was neat , clean and well appointed. The kitchen is modern and has everything necessary to prepare meals. 6 beach chairs and 8 badges were also supplied. The walkway to the life guarded beach is right across the street. Location is great, just a short bike ride to restaurants and amusements. Very kid friendly area. Definitely planning on renting again next year. Great house with lots of room and wonderful location. Use of garage for storage of kayaks/surfboards provides peace of mind. Owner very pleasant and responsive. Look forward to next year! Wonderful house in a wonderful place. The AC was broken when we got in on Saturday, but was fixed promptly on Monday. I am glad that you had a great vacation . It was unfortunate that the AC unit picked your vacation week to start to die. I had a new unit put in as soon as I could . I appreciate your patience. I hope to see you back in the future. We were very happy with our stay. Very convenient to the beach and very comfortable. Had a wonderful week. Fantastic house so close to the beach.